After 2017 in Houston, which featured everything from the costliest hurricane to ever strike the United States to a rare December snow, we can hardly guess what the near year will bring. (Certainly, we can be relatively confident in heat and humidity). Whatever this way comes, be it snow, rain, or intense heat, we’d like you to know that Space City Weather will be here every step of the way. And that is why I am so thrilled to announce today that our sponsor during last year’s hurricane season, Reliant, has stepped forward to support the site for all of 2018. The company, and its president Elizabeth Killinger, believe strongly in the value we bring to to the Houston community, and they wanted to support our efforts. That means two important things for readers of Space City Weather. One, we will have no outside advertising on the site. None. No auto-play videos. No pop-ups. Just a clean interface. This should make for lightning fast load times. Perhaps most importantly, it means we do not have to generate clicks for the sake of clicks. We don’t need to clickbait you because the value of our site isn’t determined by traffic. So if there’s not much to say about a 95-degree day in August, we won’t waste your time (or ours) by saying much. Two, neither Matt nor I has much of a background in business or marketing. We’re scientists. We’re meteorologists. We’re writers. We just want to inform, entertain, and help you make decisions about weather and your lives. To that extent, having Reliant sponsor the site for all of this year means we can focus on weather, and pay with bills, with a minimum of distraction. Finally, let me just say that I’m personally pleased that Reliant is back. Their very name is part of the ethos of this site. We aspire to provide a source of reliable information about weather in the greater Houston area. They’re a reliable provider of electricity and home services to the same market. It’s a great match for the new year. Is there a web site where we could thank Reliant and its president, Elizabeth Killinger, for picking up the sponsorship? Sweeet! Thank you Elizabeth and Reliant for your support of the site. I look forward to further visits here, even on the standard-issue hot and humid days of summer. Thanks Eric and Matt, and all who make Space City Weather what it is. nice. let’s get the schwag rolling! need a t-shirt! One of the reasons I like this site is the no-nonsense, common sense approach and presentation of the topic. Keep up the great work and thanks. Yea Baby! That is great news! Thanks Reliant. Eric, awesome to hear they’ve stepped up and sponsored the site for the whole year. Out of curiosity, are they requiring you to write the “Sponsored” articles we saw last year when they were sponsoring? There will be six to eight of those spread out across the year. I look forward to your postings for the weather forecast, because of your accuracy and, because of the no hype. So glad you can focus on the weather and not raising money. You should still sell t-shirts though! Wow. Says a lot about the sponsor knowing a good blog when they see it. As a reader, I’m thrilled but not as much as you guys must be! Looking forward to knowing what to expect in time to prep … Happy 2018! And thanks for the exceptional weather posts. 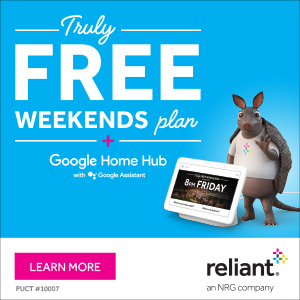 Congratulations, and thank you to Reliant! Awesome – thanks to Eric, Matt and Reliant. Great weather info each day. My trusted source for what to expect! That is awesome! Thank you. Reliant! Thank you also, Matt and Eric, for keeping us informed with just the facts…..honest meteorology! Good for Reliant! The company knows a good thing when it sees it. Thank you, Reliant! This weather site is the best thing ever to help us prepare for whatever the weather is going to be. It’s prognostications are much more accurate than national weather sites, tailored as it is to our Southeast Texas weather outlook. And the “no hype” and no advertisements insures that we check the weather on this site every day. Even if nothing’s happening, the report is fun to read. As a marketing professional with 30+ years in the field, Reliant is making a very wise investment to be associated with a news source that is authentic, reliable and straightforward. Hats off to the Reliant marketing team for making a very wise choice. Thank you Reliant! We love the Space City Weather emails. Thank you, Reliant! This kind of local involvement is one of the main reasons we stay with you. “Neither Matt nor I has much of a background in business or marketing.” Don’t sell yourselves short, guys. Your sound thinking and analysis based on science and meteorology skills have given us a “product” that’s no hype and almost always “spot-on” in accuracy and precision. High quality products attract “customers” (readers) and the most important factor to a successful “business” is customers. Yay! That is awesome news, guys. Woo-Hoo! Congrats on a fine job. Now where can I get my Space City baseball cap!!?!! Congrats! Wonderful news for all of us. It would be interesting to know the number of clicks you receive on a typical day, a weather event day and during the hurricane? Also, your clicks must be growing too! Is that information something you can provide? I second this. I think seeing the site logs in the days leading up to and through Harvey and the snow day would be really interesting. Here is a nice article that details some of what you asked. Somebody at Reliant is very smart AND very caring to the Houston community. Congratulations to Eric and Matt! I have been following your blog since sciguy days and have loved every post. Thanks for taking us through the droughts, horrible summers, scary storms, and artic blasts! So exciting! You guys are my go to source for all news related to weather! Congrats! Great news ! Reliant would be the single word I would use to describe your service.